Why are Lightning Flashes Jagged? Science has long claimed to have the explanation of lightning discharges well under control. But the discharge paths followed by lightning strokes often seem unnecessarily tortuous when more direct routes are readily available. ... Primary cosmic rays carry considerable energy, most of which appears near the earth's surface in the form of cascades of secondary particles that create complex ionized tracks as they penetrate the dense lower atmosphere. Lightning bolts would tend to follow these precursors along their crooked trails. When a high energy particle such as a cosmic ray particle from space passes through the atmosphere it leaves behind a trail of charged particles by colliion with atmospheric molecules leaving behind a trail of free electrons and positive ions. These ions and electrons rapidly recombine, but until they do, a low conductivity path exists along each particle track. This propensity to generate secondary ions is much stronger when the cosmic ray particle is travelling more slowly so that there is a much higher ion density near the end of each particle's trajectory as it is brought to rest by these collisions. Thus short, straight line conducting paths are continually coming into existence and decaying away as the atmosphere is bombarded by (low energy) cosmic rays. During a thunderstorm a high electrical potential is set up between the storm cloud and the earth's surface. In the absence of cosmic rays the atmosphere is a very good insulator, much too good an insulator for an electric arc to form. However straight line conducting paths are continually forming and decaying in a random manner due to cosmic rays. These straight line paths will not, in general, intersect one another but from time to time will lie sufficiently close together for the electrical resistance of the air gap between adjacent tracks to be relatively small. 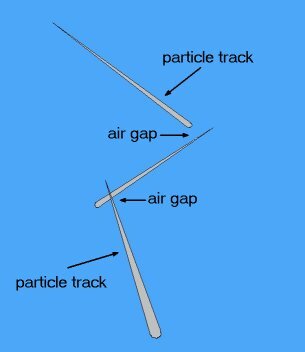 If we assume that the electrical resistance along each conducting path is close to zero, the total resistance between the cloud base and the earth is the sum of the resistance of all the air gaps between neighbouring cosmic ray tracks. This quantity will, of course, fluctuate wildly over time, but from time to time it will be sufficiently small for the total electrical resistance to fall below the threshold at which an arc can form. When this happens an electric current will flow, opportunistically following the combination of cosmic ray tracks and small air gaps which has the least electrical resistance. Once the current starts to flow an avalanche of electrons and ions will form as each air gap "arcs over". This is the reason why a lightning flash has the appearance of a sequence of connected straight line segments. Note that, according to this description, it is the low energy cosmic rays, those slow enough to be stopped by the atmosphere, which are the main players.